Anyone notice that Courtney has been missing from what Courtney wore today? Last post was Dec. 21 and penned by her minions. She’s ostensibly working very hard in London and doesn’t have time to post her daily clothing choices. Hmmm….I think that might be because her clothing choices have been limited to hospital gowns and restraints. Just saying. Her most recent interview with NYT detailed how she arrived in her own hotel room stark naked (not even shoes) with her Marchesa dress insouciantly tossed over her shoulder. Her publicist later claimed it was due to an interaction between Courtney’s anti-depressant and the one cocktail she sipped that night. Yeah, ok. I’ve mixed them too, but have always managed to keep my clothes on. Just saying. 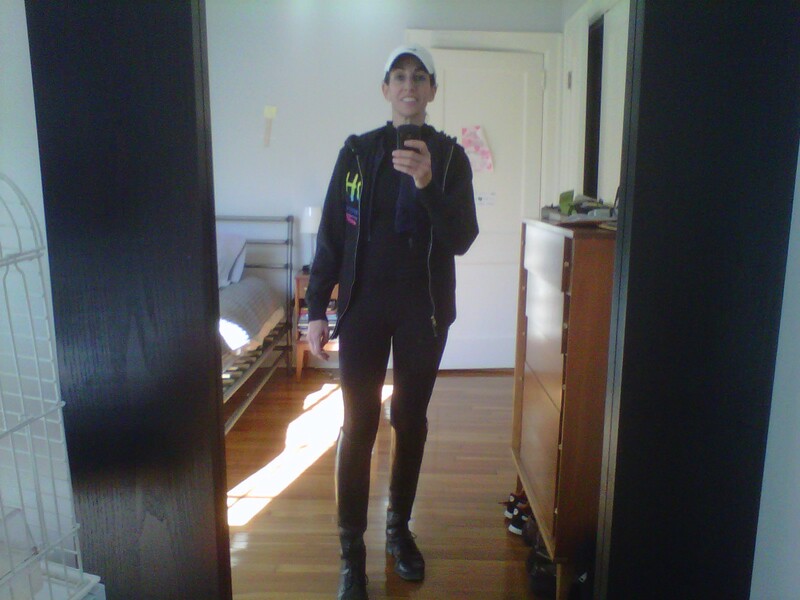 Nike running cap, Dirty Heads sweatshirt, blue Tipperary protective vest (no safety rating but is confidence boosting), black Merona (Target’s in-house clothing line – most would not admit to wearing this) turtleneck, black Kerrit’s winter-weight riding tights, Ariat rear zip field boots. Unseen: Enell no-bounce bra – advertised as the ugliest bra you’ll ever own. It is. And, last but not least – Jelly Pantz!!! My latest purchase and they have changed my equestrian life! And my dear hubby’s, too.